There are so many spring trends that I am loving right now. The thing with trends is though, some of them don’t stick around for more than a season (although there are some that prove me wrong). Because most trends are just that-trends-I don’t like to spend too much money on them. I would much rather invest my money on something that will be in style season after season. Because there are so many spring trends out there that I can’t get enough of, I put together a small spring trend guide- and nothing is over $30! 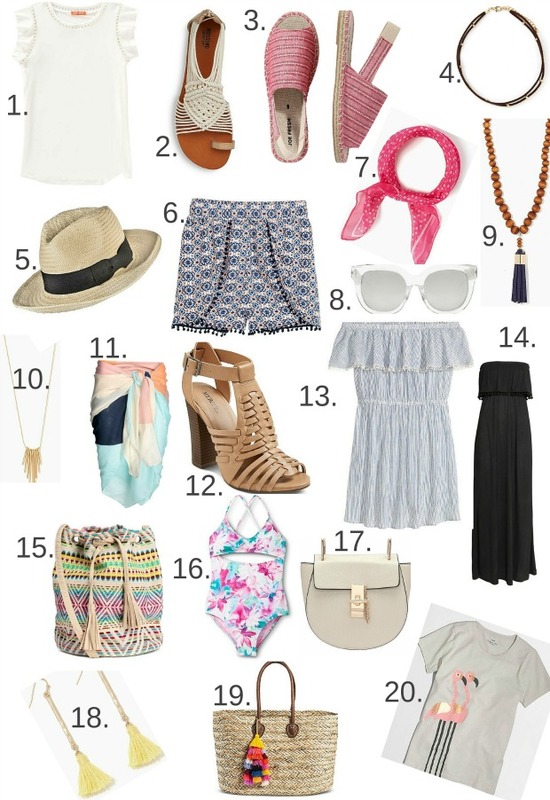 I made sure to include all of the it items that we’ve been seeing: pompom details, off the shoulder looks, espadrilles, crochet, tassels, and even the huarache style sandals that I know I wore when I was younger! I love everything. Everything. I really can’t get enough of tassels and pompoms! I wasn’t sure how I felt about the whole kerchief trend coming back (should have kept the ones I had when I was younger) but it is slowly growing on me! I’ve mentioned before how the whole off the shoulder trend keeps making its way into my closet (here, here, here, here and here) but add a little pompom detail and I love it even more! I will say that the Target tote is $34, which obviously is more than $30, but I couldn’t pass it up. Plus, with their discounts and if you have a Target card, chances are it will be less than $30! At least that’s my reasoning for including it! HA! Great picks! The flamingo T-shirt is super awesome!